Buskers (a.k.a. “street performers”) are a viable tool for rejuvenating public spaces. If done well, busking is a high-impact, low-cost option. No infrastructure is needed, no barriers, no ticket sales, no marketing, no strategy sessions; just an artist, who doesn’t need a salary, performing for tips. And they can start tomorrow. Buskers prompt social interaction on the street level, create intimacy and allow people feel comfortable and safe. They also provide one of the few forms of live entertainment that low-income citizens can access and enjoy. And yet, busking is at risk of being licensed out of existence, with permit systems, auditions, fees, written application processes, equipment bans, scheduling and branding making the spontaneous, surprising art in public spaces a thing of the past. Some cities have banned busking altogether, some don’t have any regulations at all, and yet others actively celebrate and support street performers. The management of general public space depends on each city’s prevailing attitude towards social inclusion, freedom of speech, accessibility and sense of comfort. Busking can work really well, even with regulation. For example, Glasgow’s Buchanan Street is one of the most successful commercial pedestrian axes in the UK. Buskers are considered an essential part of the experience and identity of the street. The local policy-makers do not interfere as the street continues to be a welcoming place. The community is allowed to self-regulate. Melbourne has introduced auditions for busking acts that might be considered “dangerous” (swords, fire, etc), but the judging process is in the hands of other buskers. In that way, Melbourne authorities have allowed the street performers to self-regulate, despite their safety fears. In Singapore, because of the great amount of buskers wishing to perform, the City established an auditioning process, similar to a talent show. The National Arts Council and the local performers run the process together. In practice, though, many street performers do not bother with getting a license; as long as nobody complains, the police don’t bother them. Dialogue and interaction between buskers and policy makers will work best if busking is approached as an asset to be encouraged rather than a problem to be solved. To get the best busking talent, cities must make the best buskers want to work there. To achieve this, busking polices and guidelines should be developed in cooperation with the city’s busking community. Properly implemented, a best practices guide for busking can be hugely rewarding for all concerned. Astute authorities will leverage their cities’ reputation as busking hotspots in order to boost their cultural capital. A common complaint is that failing city centres are moribund while commercially successful ones are becoming homogenised. 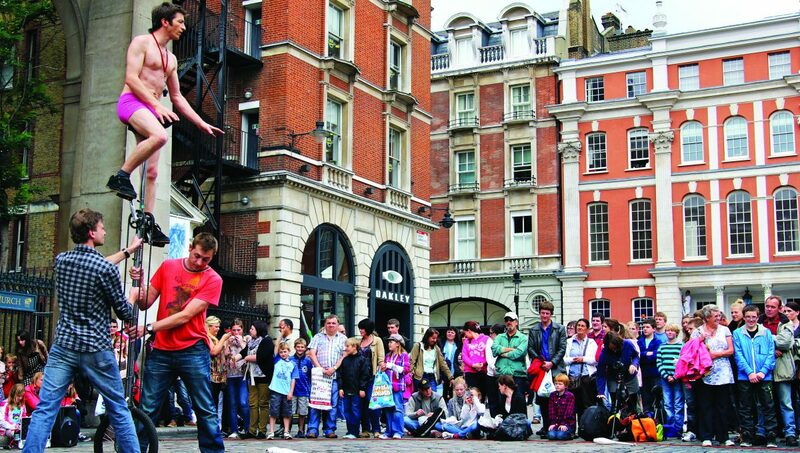 A vivid street-performing scene can draw people into city centres and encourage them to spend time there. A lively scene can demonstrate the culture or character of that city and differentiate it from its competitors. Freedom of expression is an inalienable right; permission should always be granted and permits should never be mandatory. Instead, if restrictions on busking exist through a licensing system, it must offer significant benefits in return. It must be desirable. The license should be seen as a reward for buskers who are trying to make the city a better place to live or visit. As such, the punishment for breaking the rules is having the license revoked. Threatening fines, confiscation of equipment or arrests will not foster a sense of inclusion. If there are buskers who continually refuse to adhere to the rules, let local buskers in the area know that if that performer does not stop, the rules may have to change, and ask them to sort it out among themselves. Administered properly and supported by a busking community that feels valued, a good license system offers tremendous potential benefits to residents, tourists, artists and businesses alike. Busker-friendly cities attract the world’s best artists who can help create lively, vibrant public spaces, allowing cities to draw on the energy of busking and greatly enhance their city brand. Auditions ensure that artists meet a basic standard. With auditions, anyone can apply at any time, via video or in person. Pitches already being successfully used by buskers should be left alone. Not all the best pitches are licensed. The licence recognises the difference between different types of act (circus, music etc). There are no limits on the number of permits given out every year. The program is promoted annually at a large media event. Scheduling systems must be intelligent, accessible by phone and open 24 hours. Anyone can perform without a licence on licensed pitches, if they are free/ available. A dedicated official must be appointed in case of questions, disputes or complaints. A website individually promotes the buskers involved in the program. The city visibly encourages and supports the artists on a day-to-day basis.